The Grand Arbor convida você para renovar a sua ligação com o poder de cura da terra. Fuja para o coração de 62 acres isoladas de floresta arborizada. Este quatro quartos, dois anos e meio familiar casa de banho cabana de madeira de férias é o lugar perfeito para descansar e desfrutar dos prazeres simples da vida. Confira o calendário on-line, indo para o site abaixo - basta clicar em 'reservas'. A cabine 2.900 pés quadrados foi construído em 2004 e está localizado no sudeste de Indiana, menos de uma hora a oeste de Cincinnati ou uma hora a leste de Indianapolis na área de Metamora / Brookville. Convenientemente localizado a apenas 10 minutos de Brookville State Park ea 5 minutos da histórica cidade pitoresca de Metamora, este refúgio isolado congratula-se com você e seus convidados. Alguns de nossos visitantes recentes dizem-nos que que a Grande Arbor sente como chalé de montanha devido à sua espaçoso interior. Com grandes janelas de vidro com vista para um bosque maduros e riacho, o Grand Arbor está situado em um vale com uma exposição do sul. Circundantes trilhas para caminhadas e uma infinidade de atividades ao ar livre são abundantes. Devido à sua localização pitoresca e conveniente, o Grand Arbor verdadeiramente é um lugar ideal para escapadelas de fim de semana, férias, reuniões de família, casamentos, licenciado / partidos de Bachelorette, viagens de pesca, passeios de golfe e até retiros corporativos. Há uma sala de jogos na sala de recreação no nível do solo que agora apresenta uma mesa de bilhar regulação de tamanho completo. Isso é certeza de ser um sucesso com crianças e adultos. O Caldera jacuzzi ao ar livre é popular entre os clientes. Esta é uma ótima maneira de relaxar no calor das águas calmantes fora e apreciar a paisagem natural que rodeia a casa. Veja a página Web Grande Arbor para fotos adicionais e mais informações ou clique no link abaixo. Uma casa de banho completa está ligado ao quarto principal no nível principal. Um banho de meia está convenientemente localizado fora da Grande Sala. O banho completo restante está localizado no nível superior entre dois quartos e loft. This was our fourth year at Grand Arbor. There is plenty of room for us (9 adults;8 children). The addition of the bar in the basement game room looked great. Once we read the journal you keep of guest comments the kids kept busy most of the afternoon determined to find that money! They found none but then we had fun hiding some $1 bills of our own and thinking up clues. The two new couches in the family room were great but, wow, they made that old one that is still there feel even worse!! Time to get rid of that thing! 😁 The only other improvement we would like to see is updated WiFi. We could connect but it took forever to download and buffering was constant. All in all though, we enjoyed our time immensely. Great cabin, with many extra amenities to keep guest entertained. Our group had a blast. There is plenty of space for adults to hang around the open kitchen/family room area. The kids spent their time in the game room. I highly recommend this cabin. We had a great, long weekend staying at the cabin. The VRBO app was awesome providing all the details necessary for the weekend. It was spacious and very clean. The hot tub was great to use during the cold, and the kids loved playing in the basement game room. The internet worked fine for us the whole time. We got ice and snow during the weekend, and I made a call leaving a voicemail about the drive being plowed. Not sure if this was already the plan, but people were there within the hour of that call to plow the snow on a Sunday. The only thing that could have been better was a bigger mat for drying feet on the way in because it was so wet outside, but other than that, it was absolutely fantastic! We had a wonderful time! We really enjoyed our stay in this cabin over New Year's weekend. It is incredibly spacious and homey. The hot tub was also amazing. Overall, we had a blast and definitely want to come back next year. - There are so many beds and room to spread out! Also, the couches are quite comfy. - Huge dining table for family meals and board games. - The downstairs ping pong table + poker table was nice! - Very nitpicky, but the TV in the main room is really high up. If you watch for too long, your neck might hurt from looking up... but you're at a cabin, so do something other than watch TV! - It got rather cold at night, but I think we didn't have the heat turned on properly. - Also, the pillows were super hard. Definitely consider bringing your own pillow. 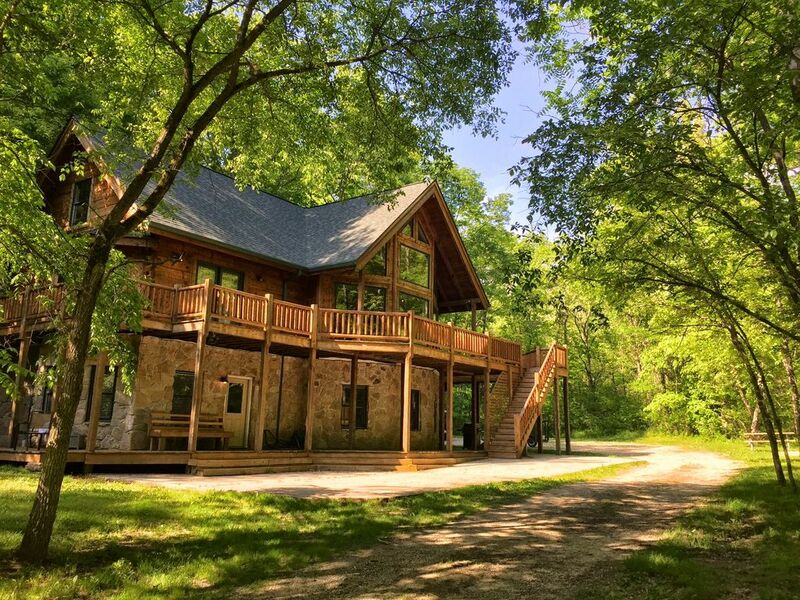 Beautiful secluded spacious family getaway! This was one of our best big family Christmases ever! The property was the perfect multi-bedroom setting with huge common area and a getaway downstairs for the kids. The property was immaculately kept. Just can't say enough positive things about the property. WE'LL BE BACK!